McCaleb Funeral Home is facing a similar challenge as many other independently owned funeral homes. They are constantly battling a large, corporate, cemetery and funeral home across town that is known for aggressive sales tactics. The corporate funeral home not only has an aggressive sales team, but they have a long rooted history in the community. McCaleb Funeral home has a rich tradition serving the Weslaco, TX community. However, the corporate funeral home encroachment has placed an urgency within McCaleb Funeral Home to explore new methods to drive pre-need leads and contracts. “It’s an ongoing struggle. As a branch of a much larger corporation, they have resources that make it difficult to compete with. We must think differently and try new methods to connect with families to outwit them.” says Carla McCaleb, owner of McCaleb Funeral Home. Preneed leads have historically been dependent on direct mail. Family surveys and aftercare mailings are still the most common means to reach out to families and stir up interest. However, their effectiveness is dwindling. Word of mouth, community events and other methods of bringing awareness to planning ahead will continue to be effective. The hurdle with these forms of lead generation is that they are difficult to scale and execute due to the strain it places on the funeral home staff. The challenge is that there isn’t a scalable online solution to generate preneed leads that convert into contracts. Until such a method exists, funeral homes like McCaleb Funeral Home are dependent on lead methods that are slowly decreasing over time. With 87% of adults online, it is imperative that a strategy is discovered to allow the funeral home to connect with their community online, engage the audience, build trust and ultimately collect qualified leads. “Generating leads online is the future. It seems to be a hot topic in funeral service right now. The concept of building a repeatable process of lead generation online will be very important to our business moving forward.” says Carla McCaleb. The inability to generate leads online today isn’t going to force McCaleb Funeral Home to close their doors. However, it is important for them to compete with the large, corporate, funeral home competitor. The parent corporation has taken a stance that they are not allowing any of their branches to have a Facebook presence. This presents an opportunity for McCaleb funeral home that surely isn’t going to last forever. “We have a very unique opportunity right now in the marketplace. Everyone seems to be on Facebook, glued to their phones, and seeking information online. It is critical for us to take advantage of this opportunity to connect with the community online to educate, build our brand awareness, and drive leads.” Says Carla McCaleb. Being unable to compete at a sales force level, McCaleb funeral home needs to outthink their competition. Their marketing budget isn’t as large as their corporate competition, so stretching every dollar is important. Finding an repeatable, online, lead source will help them chip away at the larger competitor. 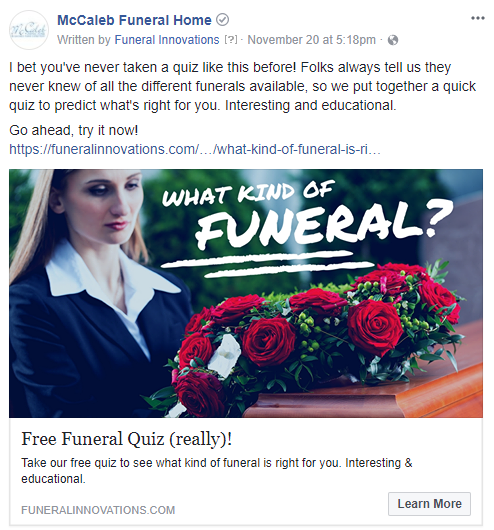 The inability to find an online lead source will set back McCaleb Funeral Home’s search in finding a unique differentiator that will help them gain market share. The Funeral Innovations team worked with Carla McCaleb to build a strategy around building a fun (yes, we thought fun) experience around funeral planning. The intention wasn’t to have a hard sell, but provide an experience to their Facebook community that hasn’t been seen before. The idea was to test if we could stir up interest in funerals without directly mentioning preneed. Reach the Weslaco, TX community with a targeted message. Try an interactive approach to lead generation. Follow up with each lead to gauge interest. Convert at least one lead into a fully funded contract. After much discussion, we decided that a quiz was the perfect method of displaying information and engaging the Facebook audience. A quiz allowed us to interact with each Facebook visitor in a fun, interactive way. Yet, in the end it encouraged the visitor to provide their information for the staff at McCaleb Funeral Home to follow up with. 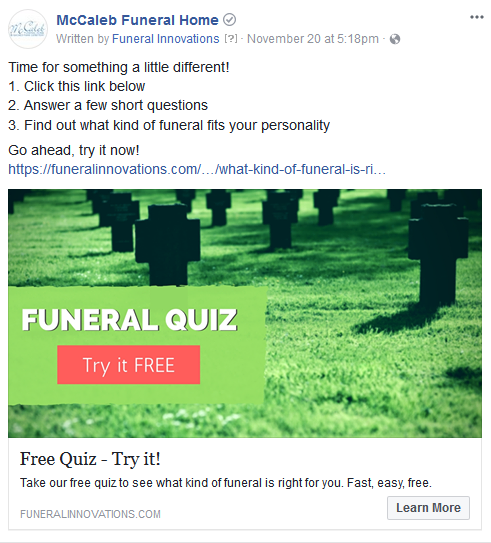 This particular quiz was titled, “What kind of funeral is right for you?” Through a series of well thought out questions, we guide the Facebook user through an experience they hadn’t witnessed before. Below are examples of some of the questions that were asked. None of the questions were deep funeral-related questions, but instead questions causing the user to think about what mattered most to them. 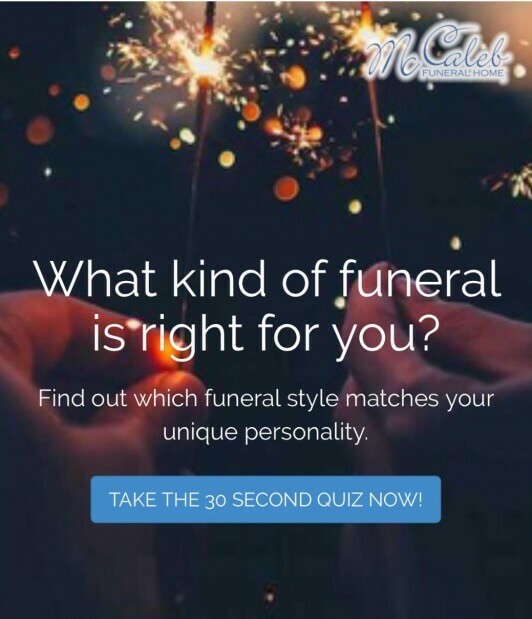 We guide them through the quiz experience, answering questions, and in the end we reveal the type of funeral that might best fit their personality. To maximize awareness, we created a set of Facebook ads that were ran in the Weslaco, TX community. 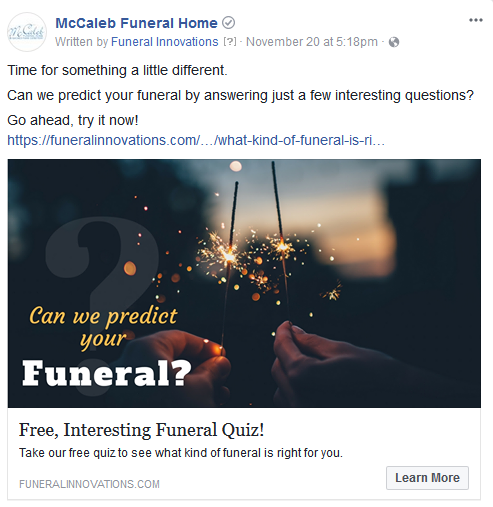 These ads didn’t show up on McCaleb Funeral Home’s Facebook page, but were considered “dark posts” that only appeared in the newsfeed of targeted Facebook users. A highly targeted audience was set within the Weslaco, TX community. We targeted only women 35+ in age. The reason we targeted this audience is because women are often the key influencers to promote planning ahead and people 35+, including parents and adult children. It was important to keep this affordable, and repeatable, so we set a budget of $375. The end results from this experiment exceeded our expectations. Below is a funnel showing how many people reached each stage of the process. The primary lesson learned from this experiment was that you can take Facebook users off of Facebook and convert them into fully funded contracts. This “fun” Facebook quiz was a very soft sell and wasn’t focused on qualifying each lead. Many of the leads were from names the staff at McCaleb Funeral Home didn’t recognize. This presented a great opportunity to engage new families they traditionally would not serve. The staff at McCaleb Funeral Home followed up with each of the 49 leads. As expected, some of the phone numbers provided were dead ends with no response. However, one of the leads met with their preneed counselor and funded a preneed contract. This particular family didn’t have any history with McCaleb Funeral Home. What this experiment proves is that Facebook opens a new opportunity to engage community members like never before. Posting to your Facebook page to get likes and comments should not be your end goal. In this example, we offered a unique way to connect with the members of Weslaco, TX and converted a fully funded contract through offering a unique experience. We firmly believe that moving forward it will be experiences that lead people to McCaleb Funeral Home’s door and Facebook provides a repeatable outlet to provide truly unique experiences.